It was an overcast day and I didn’t feel much like riding. I wanted to walk instead. With my usual hiking buddies still busy settling into their new house, I was without company, and therefore, couldn’t go any place lonely, or where I couldn’t get help if needed. I wanted to do something easy and relaxing besides. I recalled reading on a website about a scenic, unpaved road on Monte Grappa that was suitable even for excursionists in wheelchairs; that certainly seemed the ideal place. I always ask myself why I don’t go up on Monte Grappa more–it is a wonderful, fascinating place, and practically in my back yard–in fact, I can see the summit from the window of my studio. I quickly threw a few items in a small backpack and headed out the door. My neighbor, Nina, asked where I was headed, and when I told her, she said regretfully that she would have come had she already finished eating. No problem, I told her. I will wait. We drove up the main road as far as Campo Solagna, where we turned off and headed towards Colli Alti. Soon after, we arrived at a small area where I could park the car. From that point on, the road was unpaved. Off we went. The cloudy skies limited our views of the Asiago Plateau, just on the other side of the Brenta River, but through the trees we could see the sheer cliffs beneath the road we were on. 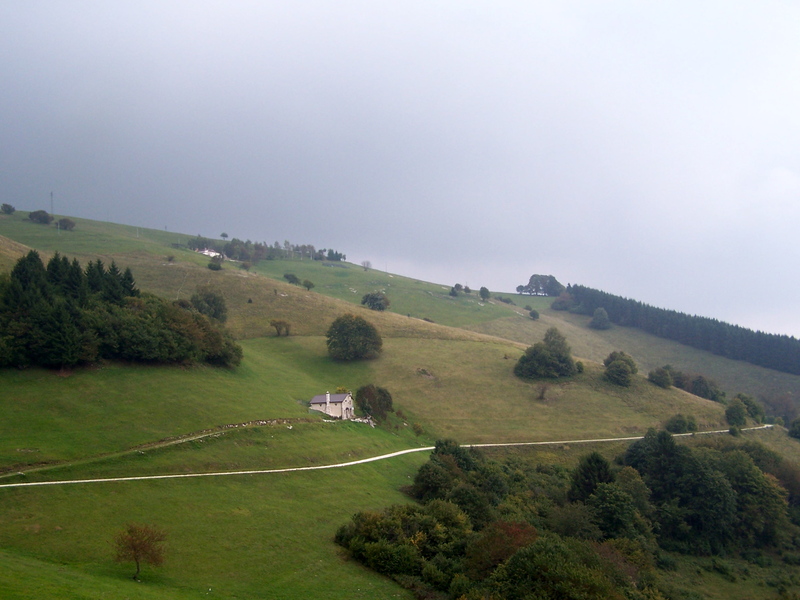 Above us were lovely undulating meadows and pastures. The atmosphere was one of utter peace and tranquillity. It was all I’d hoped and dreamed it would be. Nina had brought fresh blueberries and raspberries (my favorite), and rice cakes with strawberry yogurt “frosting.” We stopped to enjoy our snack and the surroundings. It doesn’t get any better than that. Nina had to be back by 5:30 to do her soccer mom taxi run, but of course, we kept wanting to see what was around the next curve, especially when we heard mooing not far ahead. Where were those cows anyway? There seemed to be an opening in the trees up ahead, and we were eager to see what stunning panorama awaited us. Just then we saw the cows stepping down onto the road from the pasture above. I didn’t like the way one of them just stood there, eyeing us. Then I realized that it was not a cow, but a bull. Another one appeared, giving us that same look. They made up our minds for us–it was time to turn around and head back! (My sister, who knows a lot about animals, informed me that it was undoubtedly not a bull at all, but a curious steer who posed no danger whatsoever). We hadn’t gone as far as we’d wanted, which gave us a good reason to return. The next time I will take my mountain bike and do a loop which will take me past Rifugio Alpe Madre, Col Fenilon, San Giovanni, where there are trenches and a small war museum, and Finestron. This is but one little section of Monte Grappa, so I have a lot more places to explore. This entry was posted in Hiking, Monte Grappa. Bookmark the permalink.